A high level of employee satisfaction is vital to the success of your organization. If employee satisfaction increases, so too does morale and productivity. Improve engagement, job satisfaction, productivity, and retention with an employee satisfaction survey. 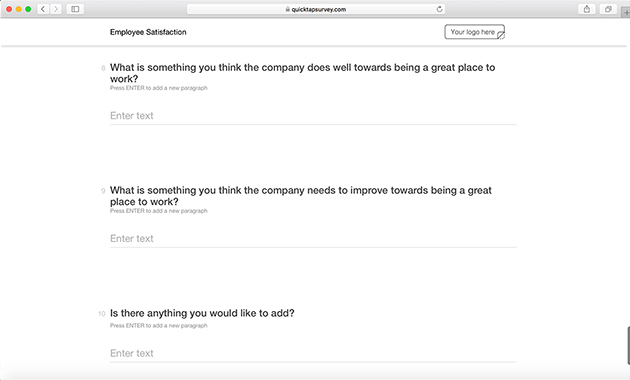 QuickTapSurvey's online template will help you gauge employee mood or sentiment on an ongoing basis. How long have you been working at the company? Please indicate your level of agreement with the following statements based on your experience working at the company: I understand the mission and goals of the company. I see a clear link between my work and the mission and goals of the company. I am inspired by the team to do my best work. I have a good understanding of the informal processes and structures at the company. I am proud to be a member of the team. Please indicate your level of agreement with the following statements based on your experience working at the company: I am paid fairly for the work I do. My salary is competitive with similar jobs I might find elsewhere. I understand my benefits plan. I am satisfied with my benefits package. I am satisfied with the office perks I am granted. Please indicate your agreement with the following statements based on your experience working at the company: My contributions to the company are valued and appreciated. I am given regular and actionable feedback to help improve my performance. I am satisfied with the extent to which my talents and expertise are being utilized. The company pays significant attention to my professional growth. I feel encouraged to take initiative and find better ways to do things. Please indicate your level of agreement with the following statements based on your experience working at the company: I have a good working relationship with my co-workers. Employees treat each other with respect. Managers treat subordinates fairly and with respect. My manager treats me with respect and values my contributions. Employees are held accountable to reasonable goals and standards. Please indicate your level of agreement with the following statements based on your experience working at the company: I have the tools and resources I need to best perform my duties. I feel comfortable sharing my professional opinions at work. My work is challenging, stimulating, and rewarding. I feel determined to do my best work every day. The pace of work at the company enables me to perform to the best of my abilities. I would recommend this company to my network as a great place to work. Please indicate your level of agreement with the following statements based on your experience working at the company: The company work environment is safe and comfortable. Teamwork and collaboration are encouraged and practiced. The company encourages and supports a healthy work-life balance. I receive adequate opportunity to interact with other employees on a formal level. I feel welcome at company events, meetings, and social interactions. What is something you think the company does well towards being a great place to work? 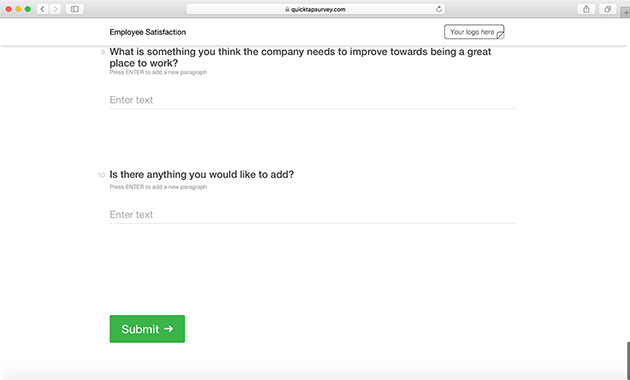 What is something you think the company needs to improve towards being a great place to work?